meant open one of those little cans of pieces and stems. Never Soup, except used in casseroles. When I was a kid I used to make a snack of the small cans of B in B (Broiled In Butter) mushrooms. I remember just plopping them in a pan with a bit of butter to heat up and eating them by themselves. For a canned mushroom, they weren't bad at all. Tortilla soup became one of my favorites the last few years so I studied many recipes and finally got it where I want it. We also make a Cajun corn soup(with shrimp) that the recipe has been passed down that is great. I love all of the Thai soups I've had as long as cilantro isn't sprinkled into it. Tan Tan Mein is my favorite soup for the last few years. I could eat it every day. 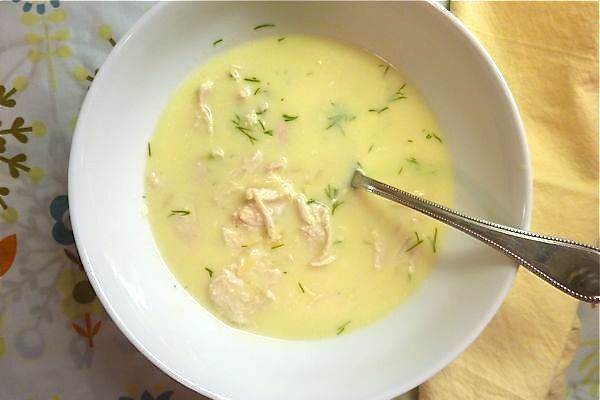 Avgolemono (Lemon/egg soup) soup made by my Greek grandmother and mother. It was sheer heaven. No matter how many times I try, it never tastes as good as theirs. Everyone loves mine, but theirs was the absolute best. Oh and one more. My husband's favorite soup I make (after split pea which is his absolute favorite but I only make that when I make a ham which is not that often) and that is beef barley. I make it often in the winter. I had a chicken tortilla soup at a local Mexican restaurant yesterday that was great. I will return for more in a couple days. Thank You for this blog, I cam to know many forms of soups can one have. But my fav is mushroom soup. For years I bragged that I never ordered soup in a restaurant because I made such good ones at home. But with limitations imposed by advancing age, I no longer cook that much and making soup usually means making enough for one meal from whatever is on hand. So I started ordering out and found out I'd been missing a lot! Ramen and Pho are two favorite categories and I can't wait for cooler weather here so it makes sense to order a big bowl. I have used ramen packets for years; there's some really good one's out there beyond the usual varieties you find at the average supermarket, but only started getting into the local ramen shops last fall. I'm still determining my preferences but I know I prefer the Shoyu based varieties. Houston has a reputation as having the best pho in the US; there are probably more than a hundred pho shops. I've settled on a rather simple bowl of Pho Tai - with beef which can range from veal to prime rib eye. A local shop has stunted a couple of times in conjunction with a local pitmaster to offer smoked brisket pho. I haven't had a chance to sample that yet. I've always liked gumbo (and was ordering it out even as I was bragging about never ordering soup at a restaurant). I wouldn't be surprised if pho and gumbo are the two most ordered soups in Houston restaurants. Navy Bean Soup is one of the greatest dishes ever concocted and I recently re-discovered split pea soup with ham. Another recent rediscovery is Wonton soup. A small Chinese restaurant near me, run by two women who are either sisters or mother/daughter, serves an awesome bowl of wonton and I try to never be without Trader Joe's frozen wonton soup entree in the freezer. I like Indian Lentil soup very much. Very tasty soup it is. It is also called dal soup. Dutch pea soup is one of my favourite soup. Although all Soups are very healthy. I don't think this soup has a name. I had some leftover pot roast in the freezer and decided to add barley to make a beef barley soup. I was inspired by the post above. I put the veggies in the food processor and made them disappear into the broth. I had some fingerling potatoes, mushrooms and a can of lentils that I wanted to use up. So I threw them into the soup too. I didn't have any onions so I put some dried onion into the soup. It was a mess of different things but it tasted great! We had some for dinner but it was even better this morning for breakfast. I've always enjoyed soups. I've very seldom made or experienced a really GREAT one but it's wonderful that they are so versatile. So often I 'wing it' and wind up with what I call a 'concoction' more than anything but the important thing for me is that it tastes good and it generally does. I get many ideas for soups, stews, chilis from both the Budget Bytes and Kitchen Riffs Blogs. My all-time favorite soup is chicken soup with extra added chili. And also add some spinach leaf to it. I like indian soup. In indian soup mostly i prefer dal soup and Tomato saar soup and many more. It is healthy and delicious and made with natural ingredient. Spinach is a great addition to chicken soup. So is chard. Is there a recipe to be shared, or at least some pointers? I don't think I've ever had a tortilla soup that I wanted to order again but they're on tons of menus around here. My favorite is the Cheeseburger Chowder at the American Hotel in Lima, N.Y. (a little south of Rochester. It's amazing as is everything else they serve. Great place. Sounds amazing. What's in it? Favourite soups, eh? That's rough, as I really like soups. 1. Hatteras or Rhode Island style clam chowder (no dairy, just clams, a bit of onion and broth). And many others, but those are my top contenders. I'm not really sure, some kind of cheese sauce, milk, I think, ground beef & scallions. The American Hotel has a cookbook with all their soups (probably 75 or so), I followed the recipe exactly and it was not the same. Cut tops off green onion, and cut them into strips about the lengrh of your pinky finger. Set aside. In a saucepan, heat the garlic and ginger for about a minute in a little sesame oil. Add the chicken broth and bring to a boil. Add a little soy sauce. Add the green onion and the potstickers. Let it come to a simmer and simmer about 5-7 minutes to let the potstickers cook. When potstickers are almost done, add a package of ramen or udon noodles, and let simmer until noodles are done. About 3 minutes. Can serve a drizzle of sesame oil on top. Makes 2 servings. You can add frozen stir fry vegetables at theend and just simmer until heated through. You can alao add frozen meatballs (12) at the same time as the potstickers, for more protein. As far as my favorite soup, New England style clam chowder with a crusty roll to dunk in it. I like vegetable soups. Good for health and delicious in taste.